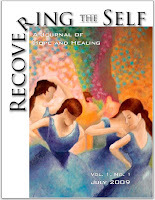 Recovering The Self : A Journal of Hope and Healing is actively seeking submissions of previously unpublished material in the form of informative articles, poetry, artwork, short stories, and commentary. Article lengths are suggested to be from 1,000 to 4,000 words, although we are willing to be persuaded to other treatments if the story needs it. Articles should be submitted in Microsoft Word 2003 format (or something equivalent) with as little formatting as possible. It is not necessary to write a query letter in advance. We do accept work that has appeared before on the web, but generally are not interested in reprinting work that is already published in print. You will receive an email acknowledgment within a few days that your item was received. Please direct all inquiries to editor@recoveringself.com.